I’m on a borrowed computer as mine has gone to be mended. Should be back at the weekend, I will check emails but it might be a bit erratic for a few days. Till then I leave you with this photo Brian took at the Midland Railway centre at the weekend. This entry was posted in Blogging and tagged Midland Railway Centre on 31/08/2010 by Joanna. Heehee Celia! We didn’t get to Cockermouth this trip, that was the proud author’s photo in his local bookshop. Slow here too….. since when have we all became addicted to speed? We might as well take it easy, and smell all the flowers on our path! Wonderful picture. Like Brydie said, the moment is captured, but so is the season, and the ambiance of times past. I love the handcart with the luggage, and the man with the cane- a small window into your part of the world. Thank you for your compliments on my photo! That is the station master/ticket collector for Butterley Station having a rest between trains! 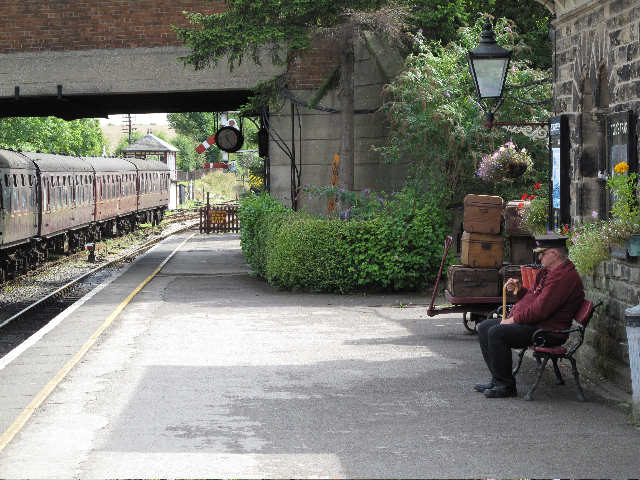 The Midland Railway is one of many little preserved railways that you find in England. It used to be an important link line to the East Coast across the Peninnes to the Lake District. Lovely photo! Is he real or part of museum station?! Sorry Brian- my thanks go to you! I love the soft focus and the lovely atmosphere- you have a great eye for a shot. What an absolutely beautiful photo – at first I thought it was a real station then I had a ‘hang on’ light bulb go on in my head – look at the luggage….. I too wondered if the man was real – poor man, he would probably like to say that news of the stationmaster having left the station is premature!! What is Brian’s book? Hi All! It’s a real station in that trains run in and out of it, though they don’t go very far these days and I am sure the stationmaster is a happy soul doing what he loves best. He’d just seen a train out and was having a sit down and a think. Wow! A published poet – no wonder you are proud, and so would anyone be! Why not add another dimension to your blog and print one here now and then? (or perhaps this is not the ‘done thing’, but I think I would be chuffed to bits and downright honoured to be able to print a poem written by my dad)?